Early 20th century commercial. 1-story, 3-bay wide, 5-bay long, gable-roofed, brick garage building formerly used as a trolley car barn. Front elevation has stepped gable with concrete caps. Central entrance on North facade has a rolling garage door. Building has an additional full basement with entrance on the rear. Building is sided with metal siding on three elevations. Built as a car barn and maintenance facility for streetcars, The Rivermont trolley line was an important factor in the ultimate success of the development of Rivermont, an area once considered a distant suburb of Lynchburg. Originally the transit company had planned to build a car barn across the street, but the obections from local residents, including the Jones family (donators of the library) forced the company to build its main garage downtown and this smaller satellite car barn instead. The building has been heavily remodeled and since 1966 has served as an automobile repair garage. It is one of the few reminders of Lynchburg's streetcar system and in particular, the Rivermont line which ceased operation in the late 1930s. 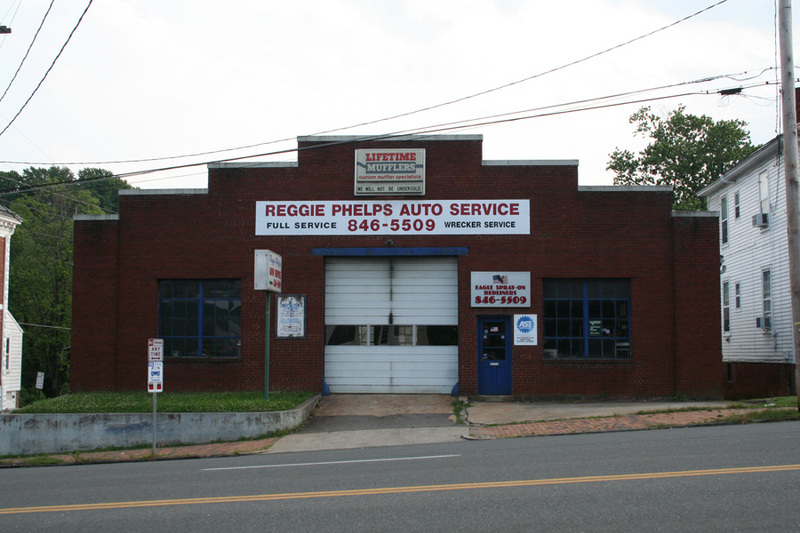 Today the building is Reggie Phelps Auto Service.